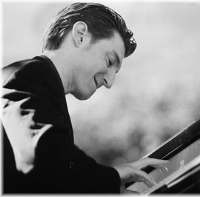 "Benny Green could be the monster pianist of the twenty-first century." An exciting and hard-swinging pianist in the Bud Powell mold, Benny Green ranks alongside Mulgrew Miller and Donald Brown, as one of a number of talented hard-bop keyboard stars to have graduated from Art Blakey�s Jazz Messengers training ground during America's hard-bop revival of the 80s, leading bands and establishing his own voice towards the end of the decade. A student of classical piano from the age of seven, Green developed a taste for jazz through the influence of his tenor saxophone playing father, and was keen enough as a child to start borrowing records and imitating the bebop sounds of the 40s and 50s. He played in school bands, until his keen ear and obvious commitment brought him to the attention of singer Fay Carroll, with whom he got his first real taste of a working jazz band--learning invaluable lessons about accompaniment and the blues, and gaining his first chance to play in a trio context as a way of opening the set. Still in his teens, he filled the piano chair in a quintet co-led by trumpeter Eddie Henderson and saxophonist Hadley Caliman, and a 12-piece led by bassist Chuck Israels. On finishing high-school, Green moved to the west coast and freelanced around the San Francisco Bay area, gaining experience working as a sideman. But it was with his return to New York in the Spring of 1982 that Green's career took a swift upward turn, benefiting from studies with Walter Bishop Jr. and joining Betty Carter�s band in April 1983--the beginning of a four year stint of performing, recording and learning with jazz's most respected vocalist. From 1983 through 1987 he also recorded with Carl Allen, Ralph Moore, Clark Terry, and Frank Morgan. The piano chair in Art Blakey�s prestigious Jazz Messengers followed, and then, in 1989, a year with the Freddie Hubbard Quintet. By 1990, Green had already led a couple of blowing dates on the Criss Cross label, but it was with his Blue Note Records debut, Lineage, that Green really came of age, earning international respect and a reputation as one of the label's most exciting new stars. Green joined Ray Brown�s Trio in 1992. He teamed up with legendary pianist Oscar Peterson for 1998's masterly Oscar and Benny. Green joined the Telarc label in 2000 with the release of Naturally. He followed up with Green�s Blues in May 2001. Jazz at the Bistro, an exciting live set of duets with guitarist Russell Malone, is set for release in January 2003. A selected discography of Benny Green albums. In This Direction, 1988, Criss Cross. That�s Right, 1992, Blue Note. Place To Be, 1994, Blue Note.